Jane has made a career and life out of finding creative, profitable ways (both on and offline) to make a difference for those in need. 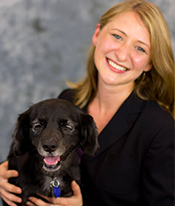 She has more than 14 years experience working to help pets and the people who love them stay together as long as possible. In that time, she's collaborated with many of the major US pet brands, including Animal Planet, Purina, Humane Society of the US, ASPCA and many more. In that time, Jane's had the pleasure of working with leading experts to make a tangible difference for pets, including driving consumer marketing and strategy for Petfinder.com, the world’s largest pet-adoption website, before joining IDEXX’s Pet Health Network as Editor-in-Chief and Head of Consumer Communications for IDEXX’s global brand. Jane received the Women in the Pet Industry Rising Star, Woman of the Year Award in 2013 and her past projects have received national attention or awards from organizations like TIME Magazine, Apple, the Webby Awards, AAHA and Search Engine Land. Jane describes her biggest passion as finding that place where empowering pet parents enables them to do the best for their four-legged family members (or two-legged, or winged, or… you get the point). Coming from an animal sheltering background -- and as a long-time pet-foster-mom -- she’s seen first-hand how important engaging pet parents in their pet’s care is to keeping them in homes as long as possible.